Why don't tire companies make more tires of the size I need? I have noticed that every now and then people post variations of the question above. This happens because they have decided it is time to replace the tires on their RV and with only a few weeks before they expect to travel they discover that the size they have is "Out Of Stock" and "On Back Order". Sometimes they discover that there are a few tire dealers with the size they want but due to the shortage the rules of "Supply and Demand" have taken over and the price of the few tires that are available has gone up by 25% more than a no-name brand or maybe 50% higher than the normal price for a tire of a specific brand. So I decided to do a little investigation. Lets put the RV tire sales volume in perspective. In the motorhome market I think it's reasonable to assume that Class B and Class C basically use LT type tires. There are some exceptions such as the new Super-C class but these are not broken out in the data I could find. These two type RV would represent about 130,000 LT tire sales. Class-A with about 22,000 units produced probably represent OE sales of about 140,000 total spread over maybe 15 sizes and Load Ranges. I am certain some sizes are relatively common and popular with a few that may represent 20,000 units in total annual sales and potentially a couple sizes with as few as 1,000 tires a year. Clearly the low volume needs of some Class-A sizes is where the shortages in supply develop. I have never heard of anyone having problems finding a 16" LT tire which is probably 95+% of the Class B & C market spread over fewer than 5 to 8 size & Load Range variations. First off a little background is in order. Tires are basically made in batches of a couple hundred to a few thousand tires, then the manufacturing plant switches to a different size or design. The only exception to this would be in OE passenger or Light Truck items that are scheduled for delivery to a major car or truck manufacturer. Lets look at the numbers so you will understand why this is. In the US there were about 7.6 Mil cars and 8.7 Mil light trucks and 400 thousand heavy trucks produced in 2014. There were about 253 Mil. passenger tires plus 33.6 Mil. LT tires and 23.1 MIl medium and heavy truck tires sold at replacement and OE. These figures include import tires. So you can see that Class-B and C combined represent about 1.5% of the LT market an Class-A size tires represent less than 1% of truck tire production. 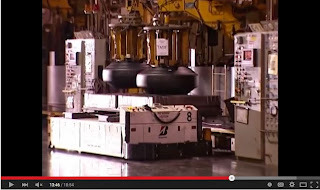 You can click here to see the 7 min video on truck tire production and the press in operation. The press holds the molds and the press system can cost upward of $1 Mil each. It also may take an hour to cure each tire so a balance needs to be reached between cost of molds, press utilization and production volume. I think you can understand that tire companies don't want a large number of very expensive molds or curing presses just sitting around and not being used so scheduling of production in the 7/24 curing room operations is very complex. So why do people have problems finding a specific size from a specific manufacturer. It's simply a matter of scheduling, equipment utilization and priority. 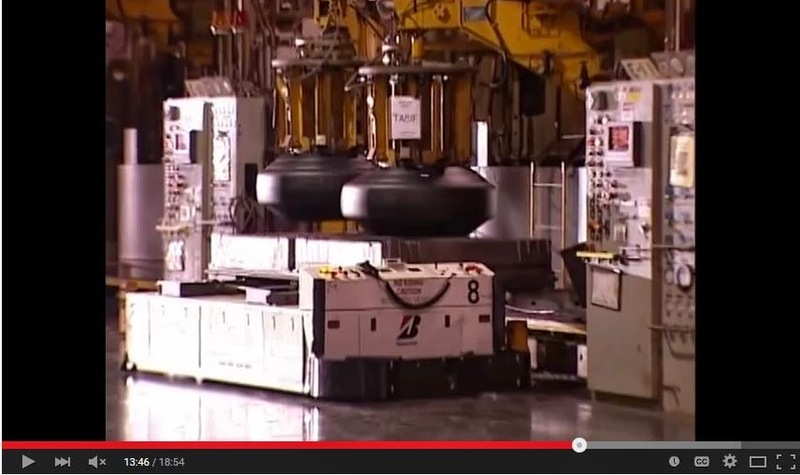 A tire company may have two molds in a specific size available and can produce about 40 tires a day in one press with two molds. They may schedule just one weeks production to build and cure 200 or so tires in a single batch than move to a different size/design tire. Don't forget your annual sales is only 1000 units a year and your customers do not want tires that are more than a few months old so you probably limit production to a single week every other month. I would suggest that short supply of a specific size for an RV application is the result of the RV company's choice to go with a low volume tire and not a desire on the part of the tire company to make customers unhappy. From the comments I see it is always the tire company that gets blamed for a shortage in supply of a specific tire as no one ever seems to hold the RV company responsible for their selection of a hard to find size. If you were a tire company where would you focus your production efforts on RV tire sales that represent less than 1% of your total sales and then on a specific size that is less than 5% of the RV market? Maybe a better thing to do is to think about tire size availability when you make a RV buying decision. This can also have an impact on your ability to get a replacement if you get a puncture while on the road and your need to carry a spare which I mentioned in this video. As I suggest in the video, have you bothered to check on the ease of finding replacement tires in the size and Load Range you want BEFORE you are in need? Shandong Jinyu Industrial Co. LTD, (Shandong) is recalling certain Jinyu YS78 and Evergreen ES89 AT tires, size LT225/75R16, manufactured April 1, 2011, to August 31, 2014 (DOT date codes 1611 through 4314). The affected tires may not be able to properly dissipate heat, and as a result, the tire belts may separate. If the tire belts separate, the tire may suddenly lose air, increasing the risk of a crash. The remedy for this recall is still under development. The manufacturer has not yet provided a notification schedule. Owners may contact Shandong customer service at 1-786-521-1296. If your RV came with Bias tires you need to read this. SEMA, or Specialty Equipment Manufacturers Association, put out a nice document explaining why it is important to understand that mounting radial tires on old wheels that were originally designed and built for Bias tire application may not be a good move. Now this really only impacts people with "Classic" RVs but maybe some have a hobby that involves old classic cars. If so I STRONGLY suggest you download and review THIS information. While we are on the topic of Bias tires there is one very important thing to remember if you decide to keep running them on your vehicle. You should NEVER mix Bias and Radial type tires on an axle of your motorhome, and if you have a multi-axle trailer never mix the two different types on the trailer. The sidewall stiffness difference can result in handling or braking problems and even tire failure in an extreme case.